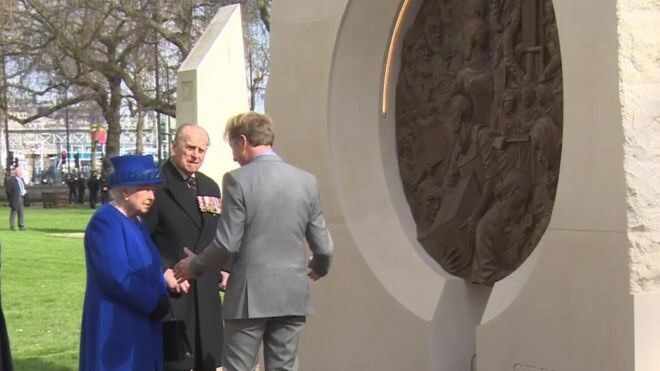 Today, Her Majesty The Queen has unveiled a new memorial in Victoria Embankment Gardens, Westminster. The memorial by gallery artist Paul Day honours both the UK Armed Forces and civilians who served their country in the Gulf region, Iraq and Afghanistan and those who supported them back home from 1990-2015. The distinctive memorial gives equal prominence to the civilian and military contributions. It consists of two large stone monoliths supporting a bronze medallion. The two-sided medallion has sculpted reliefs depicting the memorial’s theme of “duty and service”. Paul Day's aim was to create a monument that would be striking and beautiful as a work of art while being appropriate as a memorial to the men and women who served in these difficult conflicts. It is in recognition of their willingness to put themselves in harms way, even to pay the ultimate sacrifice, while endeavouring to secure peace and stability in two richly endowed but sadly blighted countries. This memorial is firstly for them and for their families. The large bronze medallion has sculpted reliefs on both sides representing 'Service' and 'Duty'. 'Service' - this side of the medallion is intended to honour those who fought; to represent this element Day portrays a patrol of foot soldiers snaking off into a landscape. A Chinook helicopter flying in the background, a reminder that all three services were involved and that many lives were saved thanks to this extraordinary machine. 'Duty' - the civilian cost of both conflicts was born heavily by the families of service men and women. While professional soldiers fought willingly, their families bore the weight of anxiety and fear while awaiting their safe return. Thus the medallion honours both the Military and Civilian sacrifice made by the Armed Forces and their families during these conflicts. Paul Day has three other major public sculptures in London; 'The Battle of Britain', 'The Queen Mother's Memorial' and 'The Meeting Place' at St Pancras station.